Are you looking for some ‘me’ time, the chance to get fitter and feel healthier, whilst having fun and making friends? We’re absolutely serious about our safe and effective technique, but our qualified, experienced teachers will ensure that you enjoy and benefit from coming to a Fitness League class. The Fitness League is a non-profit making organization in South Africa. Our objective is to promote affordable exercise classes for as many people as possible, and therefore we keep our monthly fees as low as possible. We do not lock our members in with contracts or cancellation fees. We do however have an annual membership fee of R100 which is used to purchase equipment for use within the classes (balls, weights, dinabands, ribbons, elastics, mats etc). 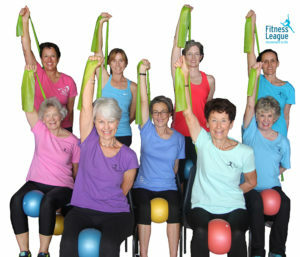 Fitness League classes are found mostly in local community and Church halls. Convenient and non-competitive, they bring the benefits of both exercising and socializing to your neighborhood. At the heart of your success with Fitness League will be the warm and friendly atmosphere in our classes and the support of our teachers. Whatever your reason for exercising, you will find it in our network of classes. As well as having fun, you’ll get a healthy amount of cardio, strength, stretch and flexibility moves. The result? You’ll feel energized and refreshed, and over time, you’ll feel and see a difference – you’ll tone up and move with more poise. To join, please click here to complete the enquiry form on our contact us page and we will be in touch.